The small, gnome-like creature lifts its hat out of the pool of blood. Out of curiosity, you take a step closer to the creature. In a flash the creature jumps towards you, quickly carving you with its sickle. It was no ordinary gnome, it was a redcap! We’re sticking with another low CR creature for this edition of D&D Monster Monday. However, the redcap isn’t your run-of-the-mill low CR creature. They’re a niche creature due to their unique and elaborate lore. Put it this way, stumbling upon a redcap isn’t going to be an accident. Redcaps are solitary creatures that are literally birthed from carnage and bloodshed. They require the blood of others to survive and will charge into battle alone to cause it. This week we jump back into Volo’s Guide to Monsters (VGtM) to take a look at another lore-packed creature. Throw caution to the wind and charge at your enemies like a redcap! 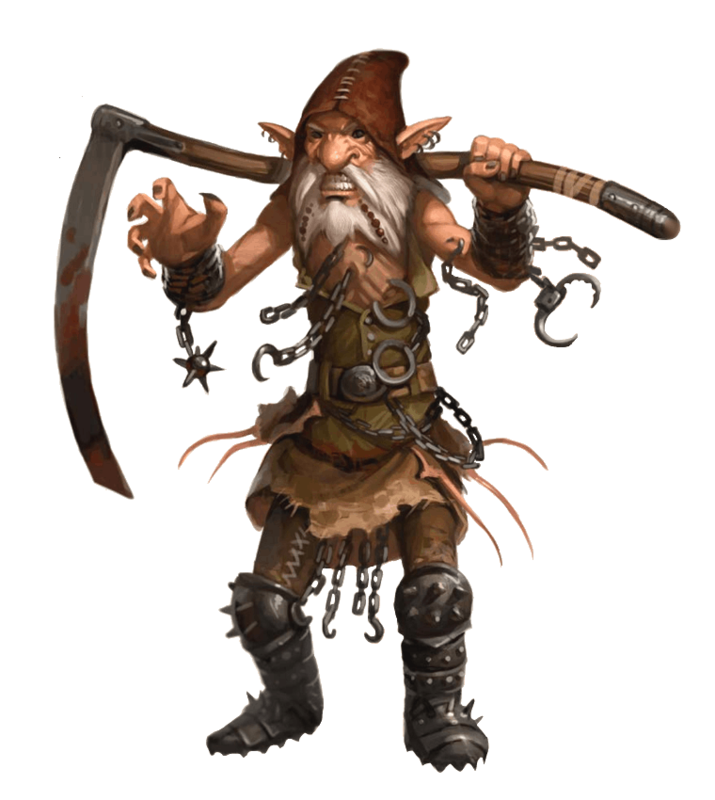 The 5e redcap art gives just the right amount of “bloodthirsty murder” while still making them look like a gnome. Art by WotC. Just like the displacer beast and eladrin, redcaps are native creatures to the Feywild. However, their existence in the Feywild is unique even compared to some of the very strange creatures that inhabit the plane. After a creature with an intense desire for bloodshed attacks another creature in the Feywild or a plane that touches the Feywild, small, red, mushroom-like caps may appear in the pool of blood after the attack. Once moonlight shines upon these caps a small, old, gnome-like creature will spring from the earth. This is a redcap. Redcaps are unique in that they require fresh blood to stay alive. A redcap needs to soak their red leather hat in the fresh blood of their victims at least once every 3 days. If they do not do so, they will vanish out of existence. Thus they are continually drawn towards bloodshed and slaughter. Redcaps are loud, unsubtle creatures which break the common D&D trope of small, forest creatures being dainty and stealthy. They’re also quite strong despite their size and aged look. They also dislike working in groups or with each other but they may take orders from evil, intelligent creatures if their goals align. A redcap has no use for money, magic items, or power. Their only desire is to be paid in victims to slaughter to prolong their existence. You can find the redcap’s statblock on page 188 of Volo’s Guide to Monsters. All in all, the redcap has a pretty solid spread of ability scores. Their Strength and Constitution are their two primary ability scores and have +4 modifiers which make them heavy-hitters and gives them a decent amount of HP to work with. Their Dexterity and Wisdom both have +1 modifiers so they’re in an ok position to deal with any of the 3 most common types of saving throws. Based on their lore, we know that they’re not creatures interested in talking or much of anything other than bloodshed. They’ll rarely need to rely on their Intelligence or Charisma modifiers so having them at +0 and -1 respectively isn’t much of a detriment to the creature. As I said their HP is pretty solid for a small creature thanks to their +4 Constitution modifier. However, they only have 13 AC which is average at best. They also have a below-average speed of 25 ft. This isn’t unexpected as they are a small creature, but it does affect their survivability. They won’t be able to outrun their enemies if they need to hastily retreat, and they have 5 fewer ft. on average to work with for positioning purposes in a combat encounter. Based on their +6 Athletics score I think we can already tell that redcaps are solid grapplers. They’re already carving out a niche for themselves as bruisers or henchmen for forest hags. They’re perfect creatures to rough up some travelers and drag them to a hags’ lair for experimentation. Their +3 Perception also leans into this role. A redcap will make a fine guard or enforcer for a less savory establishment. As a fey creature, it’s practically assumed that they’ll be able to speak Sylvan. No shock there. The art from 3.5e however… Art by WotC. Iron Boots. While moving, the redcap has disadvantage on Dexterity (Stealth) checks. Outsize Strength. While grappling, the redcap is considered to be Medium. Also, wielding a heavy weapon doesn’t impose disadvantage on its attack rolls. Iron Boots is a very flavorful trait. 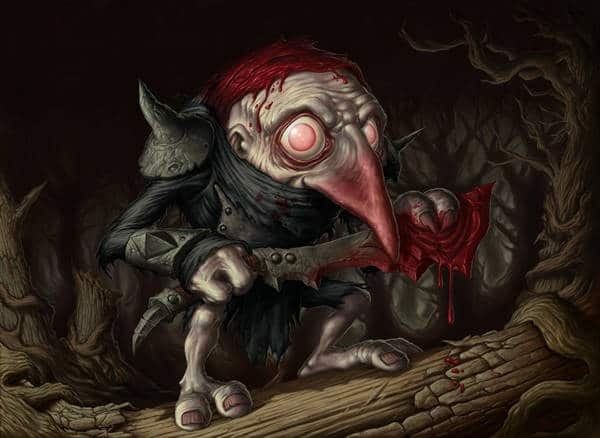 It’s certainly a nerf for the redcap’s statblock, but it comes with the price of an additional action that we’ll talk about in the next section. Do note that the trait emphasizes that they have disadvantage only on Stealth checks rolled while they are moving. They can still hide behind a crate and ambush passers-by. Outsize Strength is a very in-your-face way of showing off how strong redcaps are. They are considered medium creatures when grappling so they can try and grab large (or smaller) creatures as opposed to just medium given their base size. It’s also a nice perk to give them the ability to wield a heavy weapon without any detriments. However, this will require some homebrewing as a sickle, their weapon of choice, isn’t typically considered a heavy weapon. Ironbound Pursuit. The redcap moves up to its speed to a creature it can see and kicks with its iron boots. The target must succeed on a DC 14 Dexterity saving throw or take 20 (3d10 + 4) bludgeoning damage and be knocked prone. Three uses of their Wicked Sickle attack is very powerful for a CR 3 creature. It’s also on average 2.5 more damage than a typical weapon attack using a sickle would be thanks to the additional 1d4 slashing damage. All in all, being able to drop 27 damage using a single action is pretty solid for a CR 3 creature. Ironbound Pursuit is a situational action given to the redcap to make up for its Iron Boots trait. On average, it deals 7 less damage, but it does all 20 of its bludgeoning damage in a single attack. However, to deal that damage and knock a creature prone the target must fail a DC 14 Dexterity saving throw. It sacrifices this additional damage to basically give the redcap a Dash action that can also deal some solid damage. It’s a good ability to use to get into position in combat or lock-down a fleeing enemy, but once you’re in position you shouldn’t need to use it much. Any way you slice it, redcaps are exceptional damage-dealers. Their Multiattack includes 3 attacks that deal an average of 27 slashing damage per turn, or they can use Ironbound Pursuit to gain some movement and deal an average of 20 damage and knock a creature prone. A single redcap is considered a medium difficulty encounter for a party of 4 3rd-level characters. A single use of their Multiattack is well within the realm of possibility of downing at least one of the party members. That’s deadly, and can be enough to seriously turn the fight in the redcap’s favor. It’s also entirely possible that the redcap will hit all 3 of their Wicked Sickle attacks thanks to their +6 to hit. That’s a solid to hit modifier for a CR 3 creature. Pathfinder has the right idea. Make them gnome-like and (mostly) unsuspecting! Art by Paizo. Typically it’s ill-advised to pit a single creature up against a party of 4-5 players. This is due to the action economy of D&D 5e being always in favor of the side with the most amount of actions. It’s just how the system works. The more that you can do, the more potential you have. Most creatures at this low-CR tier, however, only have 1 strong attack or 2 weaker attacks per action. The redcap, however, has 3 strong attacks as a part of their Multiattack. Even their Ironbound Pursuit has multiple mechanics wrapped into its single action. 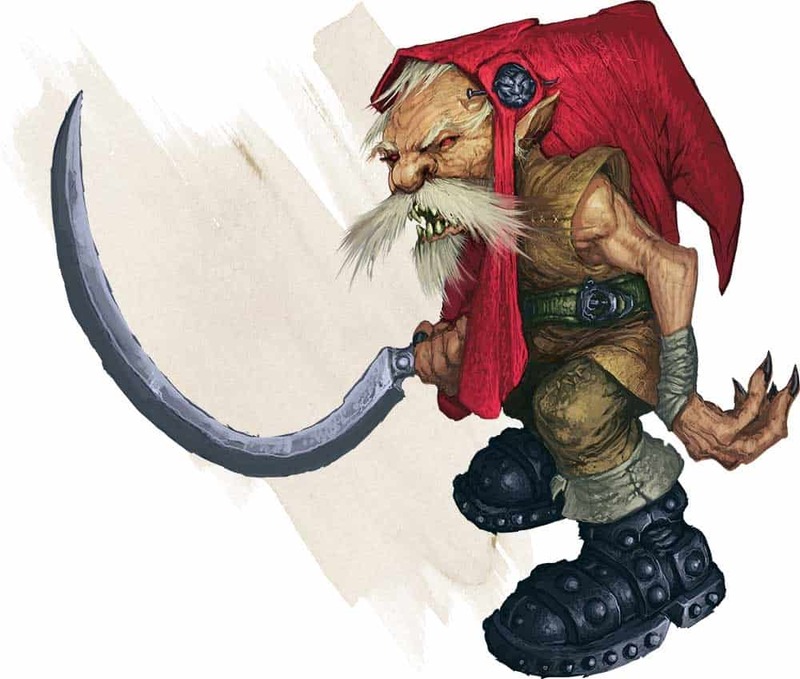 The redcap essentially gets 25 ft. of movement and the equivalent of 2 of their attacks and a shove if their target fails the DC 14 Dexterity saving throw. Therefore, I don’t mind throwing a single redcap up against a level-appropriate party. They have a great action economy that keeps up with an average-sized party’s damage output. The Achilles’ heel of the redcap is their awful defensive capabilities. While their 45 HP is decent for a small CR 3 creature, it’s not enough on its own, unfortunately. 13 AC is pretty mediocre for a creature without any damage resistances or immunities. It’s a low enough AC that for the most part, level 3-5 creatures won’t have too much trouble being able to land their attacks on a regular basis. This also seriously affects their scaling. I’d have a hard time justifying throwing a group of redcaps or a redcap and a group of other creatures at a higher level party. If they’re low in the initiative order they may as well just be free EXP. Their saving throw abilities are all in a good spot. Suffice to say, none of them are 0 or negative. They’re not in a bad position against Wisdom or Dexterity saving throws, but they could be better. Being fey does help them avoid low-level hard CC spells like Hold Person which certainly makes up for that. As a small creature, a redcap has the unfortunate problem of being slower than the average PC. While the difference is only 5 ft. per turn, it adds up quickly. In a chase encounter, a redcap will either eventually lose track of their prey, or will eventually be caught by their pursuers unless they have some sort of obstacles or natural terrain to maneuver around. It’s also effectively one less square of movement that can be used for positioning. As I said, it’s not much, but it adds up quickly. They also do not have any ranged weapon attack options which would help them close this gap a little easier. It’s true that Ironbound Pursuit gives the redcap an effective way to use a Dash action while still dealing a respectable amount of damage. However, this is the only way a redcap can come close matching an average PC’s movement speed. If the PC decides to use a Dash action as well they’re effectively 10 ft. further from the redcap. 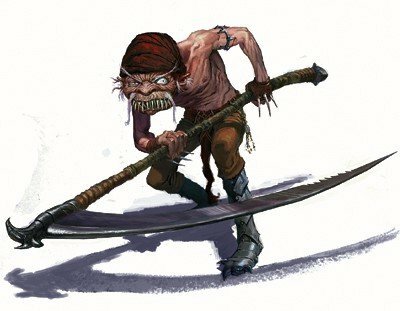 While some creatures have it worse than the redcap, having below-average maneuverability while being defensively vulnerable is a bad combination for any creature in D&D 5e. Ok, that’s too far. I’m putting my foot down. Art by WotC. A redcap is a glass cannon that only has melee options. They’re terrible at stealthing while moving thanks to their Iron Boots, so your only option is to charge right into the thick of battle and hack and slash your way through your enemies. Thankfully, the redcap does this quite well with their sizeable damage output. Ideally, a redcap would not leave themselves out in the open as they are susceptible to being kited around wide-open spaces thanks to their below-average movement speed. They should instead corner their enemies or meet them in a confined space where their 25 ft. of speed isn’t as much of an issue. If this isn’t doable, instead try using Ironbound Pursuit to close the gap between yourself and your enemies. With some luck you’ll deal a decent chunk of damage and knock the target prone, making it difficult for them to not be locked into melee combat with you. Redcaps don’t have any true AoE damage options. With their Multiattack, they can choose to target 3 different creatures with their 3 separate attacks, but that’s really the extent of their multi-target combat capabilities. It’s more efficient to find a defensively-weak, but accessible target for the redcap to focus the brunt of their attacks on. First of all, it makes sense from a lore perspective since they are all about decimating a creature so that they may soak their hat in their blood and live another day. Most importantly, it’s in a redcap’s best interest to eliminate a target as quickly as possible. Their low defenses do not bode well for the creature living past a couple of turns. However, if they can limit the number of people attacking them each round, their chances of survival are greater. Should a target try to retreat, a redcap could use Ironbound Pursuit to attempt to finish them off. However, forcing an enemy to retreat or go on the defensive is almost as good as eliminating them outright. It buys the redcap some time to deal with the rest of their enemies without having to worry about that target for the foreseeable future. The redcap doesn’t necessarily have to kill a target once they’ve dropped them to 0 HP. That being said, it would be well-within their lore to have them finish the job without any hesitation. Redcaps are a solid CR 3 creature. They are solitary creatures that don’t scale super well into the late game of D&D 5e due to their poor defenses. However, their offensive capabilities make them an excellent choice for charging at a low-level party and dropping a few of them to their knees. The lore is fun as well. They’re an interesting way to make a group of murderhobos question their decision to kill people or creatures in cold blood. If a redcap spawns from the blood of a recently slain shopkeeper, maybe the group will think twice about their murderous intentions. The book recommends them to be paired up with hags or dark mages. I like the recommendation as both of those types of creatures balance-out the redcap’s shortcomings. It also gives redcaps a reason to work together under the banner of their master. All in all, they’re a fun early game creature to throw at a group.